Team members: Dr. George MOGILDEA, Dr. Emil STAN , Drd. Florin MINGIREANU, Drd. Iulia JIVANESCU. Drd.Gabriel CHIRITOI. Electric propulsion has been an intense area of research since the 1960s, and it has benefitted great theoretical and experimental research. Electric propulsion is used for both maneuvering Earth orbiting satellites and for interplanetary missions due to its high specific impulse and lower thrust when compared to its chemical counterpart.� The initial status of the electric propulsion is mainly represented by systems that use gas or liquid propellant, such as Xenon, Argon, Helium � in the case of Hall thrusters, ionic thrusters, etc. Gaseous propellants pose some disadvantages as they have a high ionization energy, are expensive and they need a large reservoir for storage. Taking in consideration the existing limitations of these space propulsion systems the science community is looking at ways of increasing the efficiency of the existing propulsion systems or at developing new thruster technologies. As a response, our proposed model aims to increase the efficiency of the electric thrusters by using heavy metals as propellants. The main goal of our proposal is to develop an experimental setup entitled the Metallic Plasma Generator (MPG), based on a new technology of vaporization and ionization of a metal wire (lead) using a microwave field. It is well known that the microwave radiation is reflected by metallic objects, but in certain cases, the microwave radiation is absorbed by metals which results in metal vaporization. 1.2 Microwave interaction with metals � will lead to understanding the�� dependency between the different microwave powers of the cylindrical waveguide and the quantity of vaporized and ionized metal; it will analyze the influence of different metal wire diameters on the quantity of vaporized and ionized metal. Theoretical computing will take place in order to determine the energy density of the microwave radiation in the focal point of the cylindrical waveguide. 2.2�� EM Power Supply Design � aimed to have over 90% efficiency, a variable� output� frequency (25Hz � 400Hz)� and pulse duration variable (1ms -20ms). It also enompasses the design of the system cooling for the electromagnetic source (magnetron + electronic board), which will ensure the optimal temperature for operating the microwave source and the electronics in vacuum conditions. 2.3�� Design of the injector propellant � a system composed of mechanical and electronics subcomponents, which will push a reel of thin metallic wire (the solid propellant) in the high density energy region of the waveguide. 3.6�� Preliminary experimental setup functionality tests �tests in vacuum conditions in order to investigate the optimal gas quantity necessary for the MPG setup. The optimal gas quantity will be used together with metal wires in order to work as propellant. 4.1�� Metallic Plasma Diagnostics � Information referring to electron temperature, plasma density, plasma potential and metallic ions speed . 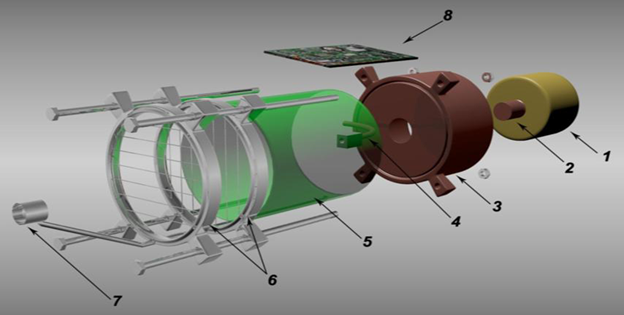 The metallic plasma generator consists of an electronic system for feed and control on the microwave source, the microwave source (commercial magnetron) and a cylindrical cavity (fig. 1). In the cylindrical cavity a metal wire is introduced in the microwave field. As a result of the absorption of the microwave field, the metallic wire will vaporize, and the vapors will be ionized. In order to study the microwave absorption process by metallic wires we conducted a MPG experimental system. The experimental model contains a microwave plasma generator, a power source, a Faraday cage, and an exhaust system of the metallic vapors (fig. 2). 8- duty factor control� of the HV the from anode magnetron. 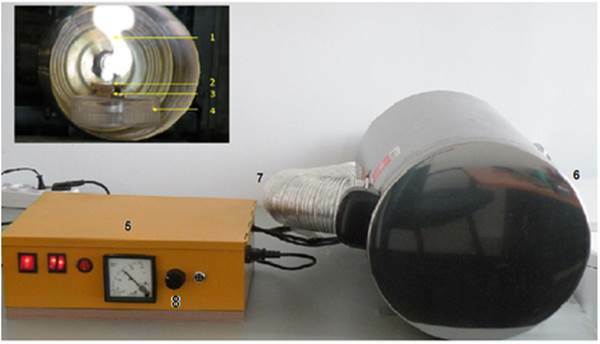 The power source of the Microwave Metallic Plasma Generator Experimental Model consists of three power sources, two low voltage sources (DC), one for the magnetron filament and one for the exhaust system of the metal vapors. The third power source feeds the anode magnetron with high voltage electric impulses (~4KV). The impulse repetition frequency is 50 Hz. The length of the impulses ranges between 1ms and 20 ms. The quantity of the vaporized metal is controlled by an electronic module. This modifies the length of the electric impulses (duty factor) of the source that feeds the anode magnetron. If the duty factor varies between 20 % and 100 % the power of the generated microwave radiation modifies between 20 W and 800 W. Therefore, by modifying the duty factor of the electric signal applied on the anode magnetron, we modify the quantity of the vaporized metal. Because in metals the microwave absorption mechanism is characterized only by ohmic losses, in our experiment the microwave absorption by metallic wires is revealed through the vaporization process of the metal wires as a result of their interaction with the microwave field. In order to observe the results of the microwave field on metallic wires, we exposed Pb wires with 0.5 mm diameter and 4 cm length in the microwave field. In order to determine the quantity of vaporized metal the microwave power was set to 150W, 300W and respectively 600W. Fig. 3. The lead sample is vaporized and ionized by the microwave field in the cylindrical waveguide: 1- metalic plasma, 2- lead sample, 3- ceramic support, polycarbonate support. Table 1 presents how the vaporized and ionized quantity of metal depends on the microwave field from the cylindrical cavity. � Investigation of the absorption processes of the microwave radiation by metal wires, ISI article in press. � Direct vaporization and ionization of the metals wires using microwave field, ISI article in press. � G. Mogildea, M. Mogildea,� Experimental� investigation� of� the� metals� vaporization and� ionization� with� microwave� used� as� propellant� for ionic propulsion, Journal of� Optoelectron. Adv. Mater. � Rapid Communication, Vol.4. No.3, pp 352-356 ,2010. � G. Mogildea, M. Mogildea,� Experimental investigation of the microwave electrothermal thruster using metals as propellant, Journal of� Optoelectron. Adv. Mater. � Rapid Communication, Vol.4. No.11, pp 1826-1829 ,2010. This project is supported by the Romanian Space Agency through (STAR) Space Technology and Advanced Research Programme (project No. 90/2013).